We really didn't do anything new in class last week. I practiced my overlays, sculpted nails, and nail art some more. I performed a few more manicures and pedicures; the good news is that I only have a few more hours and practice manicures left before I can actually go to the floor and perform basic manicures and pedicures on real clients...I'm so excited! The instructor played that outdated nail art video again and I'm not sure how, but I was chosen to teach the girls in my class some of my basic nail designs (you know...the designs that you can't go wrong with). I thought I would be a little shy but I actually enjoyed showing them step-by-steps of a design, and I felt really good for someone when they were able to do the design after doubting themselves. Halfway through the day I decided that I would go back to our little school store and buy a better brush to apply acrylics with since the brush that I'm training on has a point at the end and I would prefer something more oval. I planned to look at a few and pick out the one that felt good in my hand and was the prettiest. What I wasn't expecting was the plethora of choices — different sizes (size 8, 10, or 12), Sable or Kolinsky (I was already mystified when I couldn't figure out what size I wanted, but to throw out names such as “Kolinsky,” please slow down dear I'm feeling faint with glee), gel brushes, nail art brushes (let's not get into how many different nail art brushes there are). My intention was to buy one brush and I ended up buying a gel brush, a number 12 acrylic brush, a French tip brush (I think that's what it's called...I forgot the name once and the reason why I bought it so I went back to ask the instructor and she said it was used to make the smile line when creating a French...so I'm calling it the French tip brush! 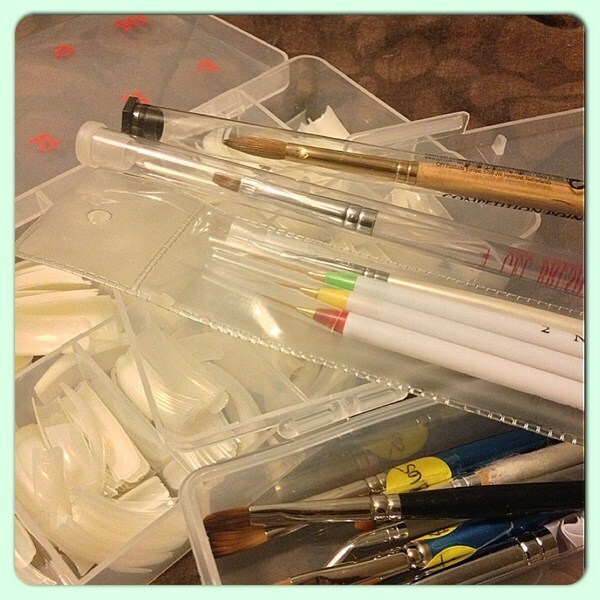 ), a container to hold just my brushes, natural tips that come in 10 different sizes, and a case to hold all my tips! I would have bought some dotting tools also but she had to order some more. I'm starting to get the hang of this (yeah it's coming together...I'm starting to think like an actual nail technician). I practiced a few more sculpted nails and even applied acrylic with a tip or two, when I had a “dadaa” moment. I don't like the number 12 brush. With my technique I feel I will be more comfortable with a number 10. In my opinion I wouldn't have known the options available to me if I wasn't attending school because I wouldn't have known where to start. Sure I've watched videos on which brush would be better, and I've stood in beauty stores staring at different brushes not sure if you would use this for acrylic or not. I've even bought some brushes (size 6 by the way) and tried my hand at acrylic but that was a failed attempt. Why? Because here at school I'm shown the proper technique on how to dip my brush in the monomer, how to form the ball of acrylic on the tip of my brush, and how the acrylic should actually look before applying it to the nail bed (is it too dry or too wet?). Now with the foundation solid I'm able to tweak the technique with what works best for me and this makes me feel confident!